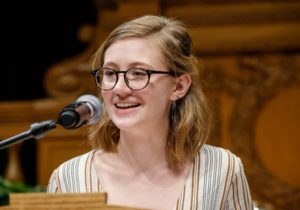 English Majors Sophie Hollis (’19) and Bri Carney (’19) both gave senior orations at Founders’ Day Convocation on February 21, 2019. Since 2010, three seniors have presented their senior orations reflecting on their four years at Wake Forest. 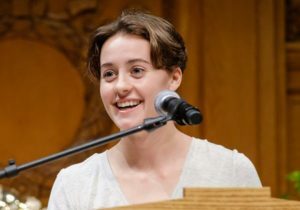 Every year, faculty members nominate outstanding seniors to prepare orations; 10 students are invited to present their orations before a faculty panel at the Senior Colloquium, and the panel selects the three finalists. Bri gave a speech entitled “Love and Spreadsheets,” available to read here. Sophie’s speech is called “Forest for the Trees,” available here. scrambled with lofted dorm beds. Is anybody from Gainsville? Columbia? France? New York? Newell? New student? Newest? Real new? Is anybody here a Christian? I signed up for cruel arts, and I was wondering if anyone else did too? Will someone with secure summer storage be my valentine? anybody can join the stress reform. you will not be allowed back home. or see firstname lastname at The Bridge for research. Jerry has ice cream in ZSR. sign up for the revolution. Live like it’s easy Tuesday.